You are here: Home / News / Events / Looking for the Perfect Gift? 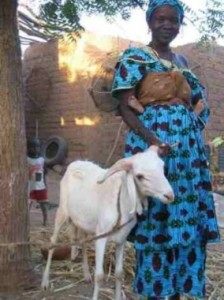 For as little as $30 you can purchase a goat or a sheep for a destitute family in Timbuktu, Mali. You can honor anyone you designate. You may even give the animal a name! Many people lost their livestock and possessions when they were forced to flee from Timbuktu during the period of violence when the Islamist rebels invade in 2012. With the help of French forces the rebels were driven out. Now, having returned to their homes, they are struggling to exist.  Your name, address, phone and e-mailMail it with your check for $30 per animal payable to Tempe Sister City to: Sue Lofgren, 2411 S. Newberry Rd., Tempe, AZ 85282-2517, 480-967-0181, lofgren.sue@gmail.com. Download our Tempe Sister Cities GOAT & SHEEP FUND brochure to donate by check. Please help make a difference today.